The powerful combination of scientific content and personalized data is a researcher's dream come true. Reprints Desk is the only solution that meets and exceeds all your research needs in one platform - one-click access to scientific content, personalized data insights, literature management, and staffed customer service. Never again leave your workflow and lose valuable time to track down the content and data you need! Article Galaxy, Reprints Desk's Software-as-a-Service (SaaS) research platform enables you to purchase or rent any scientific document 24/7, delivered to your inbox within minutes or instantly accessible via web browser. Already have publisher subscriptions? Article Galaxy links directly to your content and detects duplicate orders. What if you had ultra-personalized access to scientific data that matters to your research, making big data much more visual and actionable? Article Galaxy augments your content with scientific data insights on-demand by extracting data from multiple sources. 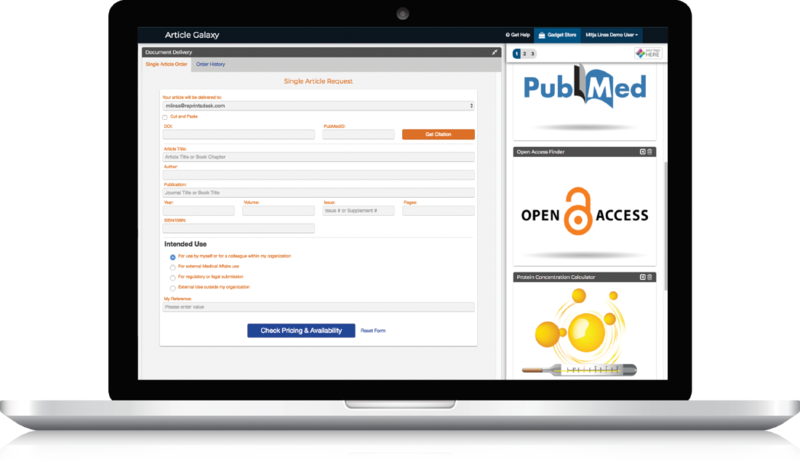 Access, purchase or rent any scientific document directly from your search results on PubMed, Google Scholar, and other popular discovery websites. No need to login - simply search your preferred discovery environment, and order with a click of a button. It doesn't get much easier than that! Introducing Article Galaxy Widget - a versatile browser plug-in that works on 70+ popular discovery websites. The widget can easily be injected into the browser bar, extracting all citations for easy viewing and providing shopping cart-like user experience to see trending article stats, buy and rent documents, or access subscription content. Don't pay more when you can get it for less! Reprints Desk's automated filters enable you obtain a paper at the lowest cost in the market, helping you to optimize spending across your literature holdings. This includes linking out to the content you already own through publisher subscriptions and tokens. 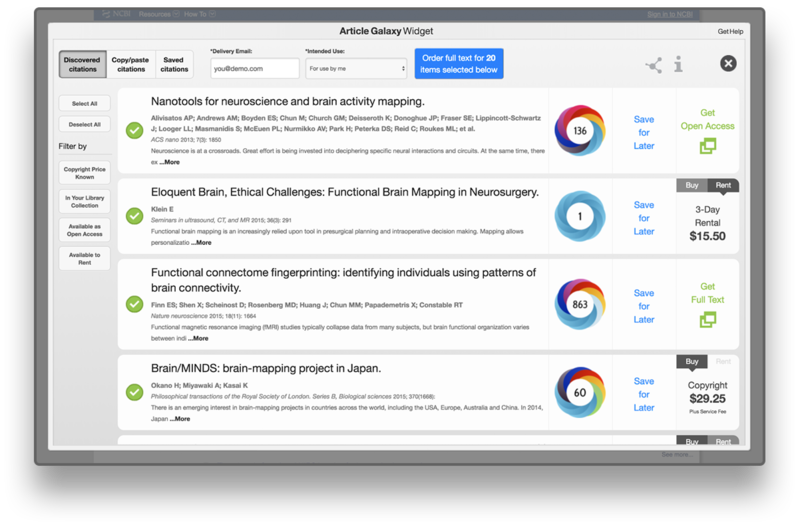 Article Galaxy is your single-source solution for RSS feeds, bibliographic reference management, one-click literature access, and copyright-cleared collections. 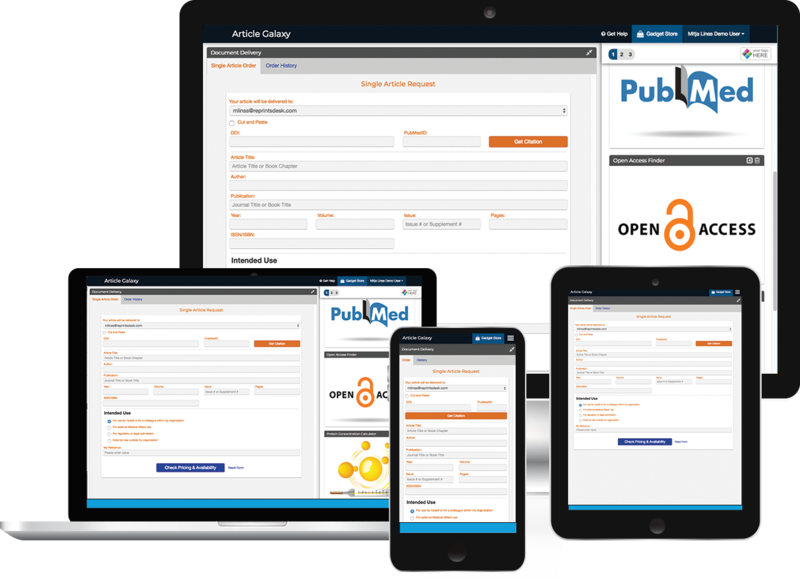 It offers fully-featured literature management capabilities - enabling easy access, curation, sharing, and organizing of bibliographic citations and PDF documents - all in one place. Manage personal PDF libraries, organize collaborative workgroups, and request full-text literature for purchase and rental. Imagine you could customize and visualize scientific data based on your research needs. 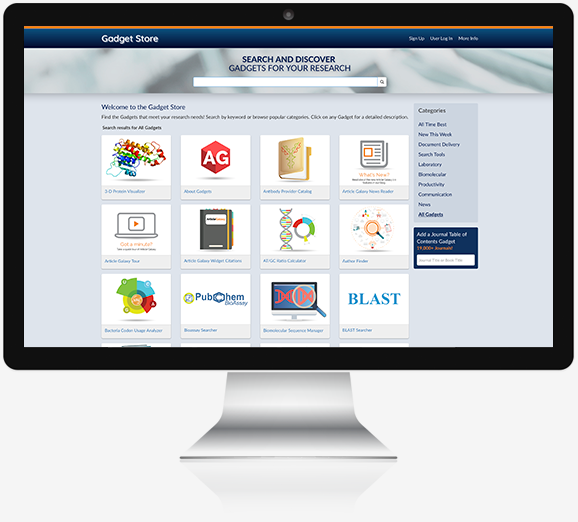 That's where Article Galaxy comes in - featuring an ecosystem of science gadgets for research retrieval, reference management, and personalized data augmentation of scientific content. Gadgets are powerful apps for science designed to perform a specific function. Gadgets personalize each user's experience and make data dramatically more useful. They enhance and securely extract data from a variety of sources, such as bibliographic citations, tables of content, RSS feeds, PDF files, XML feeds, web content, databases, and more. What Is The Gadget Store? The Gadget Store works just like an app store. It's your library of gadgets. Don't find the gadget you need? We can gadgetize any of your specific research needs - submit your gadget idea here.